Producer Na Young-seok and the cast members of the upcoming “New Journey to the West 3,” a variety show based on the classic Chinese novel “Journey to the West,” gathered to host a live session to answer questions from fans on Wednesday. When asked whether they will get over 5 million views on their prequel episodes which will be released online on Thursday and Friday, Lee Soo-geun said he expects about 2.2 million views. They decided if the prequel gets over 5 million views, they will have a huge prank on Lee for the next trip, i.e. next season. If not, Kang Ho-dong, a Korean wrestling champion-turned-comedian, will need to lose weight. One of two new cast members, Kyuhyun of Super Junior was asked about his feeling on joining the program. “I wanted to do ‘Son Goku’ since he is the protagonist (from the novel), but I didn’t know that the character has so many hardships and sufferings,” said Kyuhyun, complaining about uncomfortable hair-dos he had to do as a morning routine and high-frequency therapy machine he had to put on according to the rule of the show. 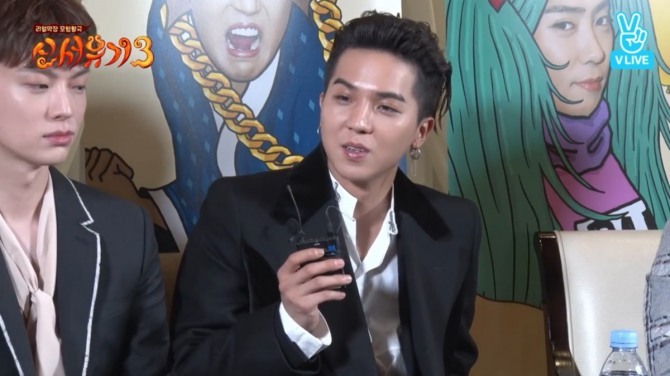 The other new face, Song Min-ho of Winner said he was scared of Kang thinking that Kang might scold Song. Song said though, throughout the shoot he realized the fear was unfounded. In this season, Eun Jiwon appears on the show with a long blue-green twin-tailed wig as he took the role of ‘Bulma,’ a character from a Japanese manga series “Dragon ball” inspired by the same Chinese novel. Lee and Eun felt bad about the producer Na since Na told them it is going to be warm on their trip which turned out to be quite cold. “I almost frozen!” Eun said. The first episode of the show will be aired on Sunday at 9:20 p.m., on tvN.